» home » magazine » 2009 » march 2009 » automated blank destacking--how much do you need? Automated Blank Destacking--How Much Do You Need? Given present economic conditions, metalformers and everyone along the supply chain must do as much as they can as cost effectively as possible. For some, that means assessing blank destacking, and determining what level of automation provides the best bang for the buck. related to the level of automation, including workplace safety, ergonomics, maintainability and reliability of the automation, acquisition and operating costs, part mix, and line loading,” explains Michael Bleau, a 23-year veteran in the industrial-automation market and president of Industry Scope, a strategic consulting, marketing and sales company in Grand Blanc, MI. In the quest to automate blank destacking, manual to semiautomatic setups can be very effective in a variety of situations. “These setups best suit production environments where stampers must adapt to a variety of short-run or low-volume blanks throughout a shift,” Bleau says. “Another option, automating for an infinite array of parameters, is much more expensive to implement and maintain. The goal should be to identify and automate only highly repetitive or safety-related tasks, and part-setup tasks that require a high degree of repeatability. 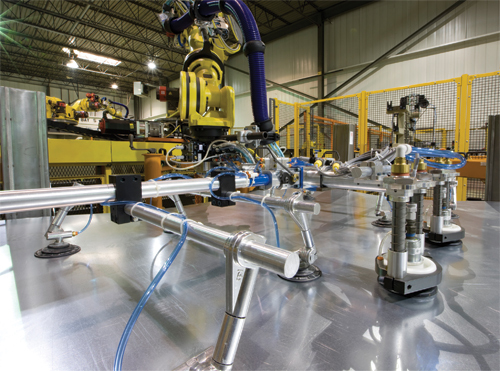 A good example of a cost-effective semiautomatic destacking setup involves using robots that automatically exchange their end-of-arm tooling between part runs, according to Bleau. The only difference between a fully manual exchange and a semiautomated exchange is the addition of a staging area or robot-accessible tool-storage area, the use of an automatic coupling ‘wrist,’ and some code instructing the robots to make the tooling change during a part changeover. Robots were employed in 2008 as ThyssenKrupp System Engineering, Inc. (TKSE), Auburn Hills, MI, delivered a semiautomatic blank-destacking system to an automotive OEM stamping plant in Ramos, Mexico, that produces interior and exterior panels. The new system replaced a manually loaded centering table. While the OEM handled the controls design and hardware, TKSE was responsible for the software and mechanical design and build. The destacker can handle small blanks to blanks as large as 160 by 72 in. —single or double-unattached, right-to-left and front-to-back—with throughput to 9 parts/min. 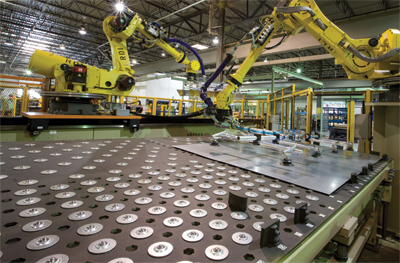 The conventional, automated portion of the destacking system includes the use of two six-axis Fanuc robots to destack and load the press line. One robot, dedicated to destacking from one of two pallet stations, moves along a seventh-axis shuttle, allowing the system to run in continuous mode. Once one stack depletes, the robot indexes along the shuttle over the queued stack and continues feeding the line. The second robot receives the blank or blanks from a centering station, then directly loads the press. semiautomatic destacking setup employs robots that automatically exchange their end-of-arm tooling between part runs. For further flexibility, a series of pentagonal holes staged in a grid formation on the table (as shown here), permit operators to place control points in various configurations to securely position blanks in unlimited arrangements. So how should metalformers go about deciding on the ideal level of automation in the destacking process? “In general terms employ a holistic approach that includes investing the time to benchmark best-in-class stampers who, while not competitors, produce parts that present similar challenges,” says Bleau. “Document what you learn from these meetings and plant tours. If you are unfamiliar with the level of automation available, seek out an experienced advisor or consultant, or hold initial meetings with a number of potential suppliers to learn what is available. Attention to lean-manufacturing principles paid off in selection of the destacking system in Ramos. It’s a hybrid of simplified manually adjusted automation and robotics, and provides for handling of complex part geometries in a simple, lean approach that has saved the OEM hundreds of thousands of dollars in equipment and controls, according to TKSE officials. In fact, this semiautomatic system came in at 40 percent of the cost of a fully automated system. The two pallet stations (that enable blank loading via fork truck) and centering station reveal the uniqueness of the destacking system. After pallet positioning, an operator unbands the stack and manually adjusts the fanning magnets. The fanning-magnet assemblies are unique in that the support armatures allow near-infinite adjustment with simple hand cranks and multiple elbows. Each station has an array of six fanner magnets, each with tall magnet heads to accommodate high blank stacks. To save project costs, the magnet heads were redesigned. The centering station also boasts a unique cost-saving configuration. TKSE designed a gravity-feed system that allows blanks to slip along the top of an array of skate balls that cover an adjustable deck. The deck is positioned on a compound angle to ensure that two sides of any given blank contact control points on the table. For further flexibility, a series of pentagonal holes staged in a grid formation on the table permit operators to place control points in various configurations to securely position blanks in unlimited arrangements. To ease setup, the system boasts color-coded stations and tool-free control-point pegs. Between the pallet stations and within the safety gates, a dual-station tooling nest serves the destacking robot, with another tooling station positioned adjacent to the press-loading robot. Both stations can store vacuum-cup tooling while the robots operate with other tools. When a part recipe indicates the need for a tooling change, the robots automatically deposit one tool and retrieve the staged tool from the station. With blanks queued in both pallet stations, the first robot grabs a single or double set of blanks with suction cups and places it in the centering station. The gravity-fed table allows the blanks to quickly glide into orientation for the second robot, which picks up the centered blank and feeds it to the press. Because the destacking system employs two load stations, an operator can change tooling and prepare the stack in one station as the second station feeds material into the press. Thus, the system can operate in continuous mode when both stations are loaded with the same type of blank. Alternatively, the stations can be readied for quick die change with a new set of blanks in the station, ready for when the current station is depleted of its production run. The system can be configured to handle just about any shape of blank including irregular and tailored laser-welded blanks, according to TKSE officials. With documentation in hand from evaluating your production environment, you are ready to meet with potential suppliers. Bleau recommends searching out several qualified, experienced machine builders specializing in destack-system manufacturing and integration, and assuring them that your goals are to define operational parameters in anticipation of a purchase and not to share competitive data between suppliers. Then individually meet with suppliers to define the parameters in a guidance document or specification for the destacker, and secure some budgetary pricing from suppliers. Information for this article provided by ThyssenKrupp System Engineering, Inc., Auburn Hills, MI; 248/340-8000; www.thyssenkruppkrauseinc.com.